Move around site with ease and have all the tools to hand. These are essential requirements for a contract cleaner. 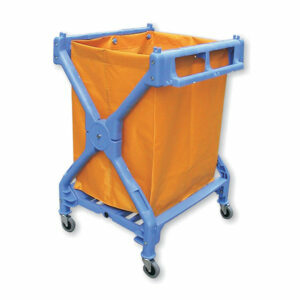 Our range of trolleys are easy to manoeuver and offer great quality at competitive prices. 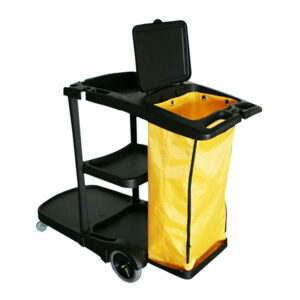 Where increase waste collection is required then this good quality trolley is the solution. Complete with 2 large PVC bags and large heavy duty wheels and push handle for easy maneuverability. 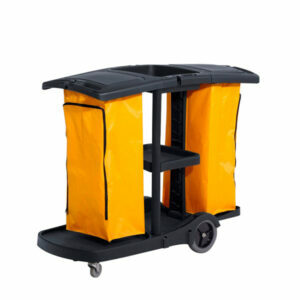 This competitively priced janitors trolley is ideal for both internal and external use. Large X shape frame on wheels for easy maneuverability,.178L capacity PVC bag which is ideal for waste and also dirty laundry collection. 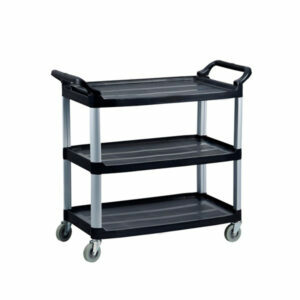 The utility cart is ideally suited for cafeteria or food outlets. The large base with 2 storage trays has a large capacity allowing the user to collect large amounts of dirty dishes less frequently and also more efficiently. 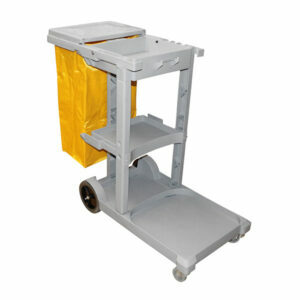 Good quality janitors trolley which can be modified into a mopping system is ideal for both internal and external use.